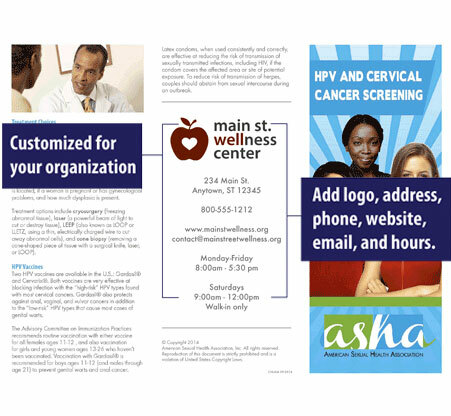 For a one-time flat fee of $30, regardless of quantity ordered, you can personalize any of a select set of ASHA brochures (listed below in the “Additional Information” section) with your organization’s information. Your patient support materials can become an advertisement for your organization and its services. Brochures can be personalized with your logo, address, phone number, email, website, and hours. We will send you a proof of your branded materials to review before finalizing your order to ensure that all of your information is correct. If you choose to reprint the exact same brochure at a future date, you can do so at the regular brochure rate, with no additional fees. However, if you choose a different brochure and/or wish to change any of the information, the $30 customization fee will be added to your order total. To re-order a previously customized brochure, please contact ASHA directly at via email. Step 1: Choose the number of brochure packs you’d like to order below. Step 3: After items are in cart, click Add custom information to add your organization information and upload a logo.